This Presentation date is April 5, 2018 at 10:30-12:30 local time. 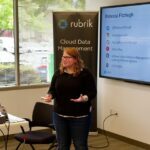 Chris Wahl, Chief Technologist, introduces the company to those new to Rubrik. He also reviews their vision for the future and overviews recent announcements. Andrew Miller, Technical Marketing Manager, reviews how Rubrik’s unique IP enables cost effective use of public cloud storage for long term archive, enabling customers to avoid tape and get more from their data. He gives a deep dive of this IP, called CloudOut. Cloud providers such as AWS give you primitives to protect your data. However, orchestrating and managing the data’s lifecycle requires additional assembly. Rubrik simplifies AWS data protection so companies can focus on building their business logic. The ability to integrate with any service portal is imperative for any large enterprise or managed service provider (MSP). Rubrik is capable of integrating with any service portal that can consumer RESTful APIs. You will see a tech preview of vCloud Director support as well as a demo of ServiceNow. Rubrik gives a first look at their newly announced Polaris SaaS platform, along with a demo of their first data management application: Polaris GPS.